The engine room battler, the steel wall protecting the defence, the skilful playmaker, it’s safe to say centre midfielders can come in many forms. Due to the ambiguity of the term, there were several fitting contenders for the top 12 who didn’t make it, such was the strength of competition. Chris Millar and Murray Davidson have been excellent for St Johnstone over the past few years, Andy Halliday has adored himself to the Ibrox faithful, Stephen Pearson’s presence has been of immense importance to Motherwell, Liam Henderson and Dylan McGeouch really help Hibs tick, and yet none of them make this dozen. This is a selection of the 12 best overall and not just their form this season, though that plays a part. Joel Sked of The Terrace Scottish Football Podcast counts down the list. Well, it hasn’t been good, Stefan. Twelve months ago you would have been duking it out with team mate Nir Bitton for top spot, now look where you are. You were superb last season, which makes this campaign even more frustrating. Johansen’s season has been emblematic of Ronny Deila’s reign at Celtic Park. Signed by Neil Lennon, the Norwegian acclimatised well to Scottish football in his first six months, allowing him to hit the ground running in his first full year and he barely stopped. Expectations were high this time around with the hope he would progress further and deliver on the European stage. He didn’t. His season has been a continuous lull. Scuttled between a deeper midfield position and his favoured number 10 role, he has been an angry presence in the Celtic team, his body language and facial expressions betraying a player who made the game look so effortless for large parts of the 2014-2015 season. Yet, the biggest caveat of the lot, he is still a special talent in Scottish football terms. A player with a velvet touch, so shrewd at unlocking defences with one caress of the ball as if massaging it into the path of fellow forwards. He doesn’t have the same impact when played deeper but there has been moments. Just that those moments have been too fleeting. A defining feature of Scott Brown’s performances this season, certainly in this writer’s eyes, has been straightforward passes no more than five or six yards slipping past their target, either out of the pitch or to the opposition. It is like watching a golfer get the jitters standing over routine putts. But what may be more concerning is the deterioration in his ability to tear around the pitch making a pest of himself, showing little respect for opposition, no matter if it is the best player in the world or the worst. It was perhaps best illustrated when Brown was shown up by Hibernian’s John McGinn in Scotland’s victory over Denmark. Brown was more than a couple of yards off the pace while his younger, more dynamic, team-mate did a lot of his work for him. He has arguably been Celtic’s most influential player in the last few seasons. In a League Cup match at Hearts earlier he was due to play but removed prior to kick off which was greeted by cheers by the home fans; they knew the effect his presence has on the Celtic side. He sets the tempo, not so much with his passing but pressing and work rate. He leads and others follow. When the game needs taken by the scruff of the neck he usually does so, Dave Mackay or Billy Bremner style. Yet injuries are taking their toll. Approaching his 31st birthday he perhaps need to manage his body better. The semi-final defeat to Rangers in the Scottish Cup epitomised his season. Plenty of toil and effort but little quality. Rather than running with a purpose he was on the road to nowhere as Rangers passed around him. • Click here to listen to the episode of The Terrace Podcast where the top 12 centre midfielders were debated. If the January transfer window transpired differently Tansey may have ended up in the red of Aberdeen and the Dons may have went closer to challenging Celtic. And who knows how his departure would have affected Inverness. There is a reason Derek McInnes was so keen on signing Tansey, he would have been a settled alternative in the middle of midfield especially with Ryan Jack somewhat off the boil. His short and long range passing would have been ideal for finding Jonny Hayes and Niall McGinn on the wings quickly, while he would have given the Dons an added physical dimension when games became a battle. Alas, it was not meant to be. It would be remiss not to notice the dip in consistency from the 27-year-old since the move fizzled out. But such is his importance to ICT he has missed only one game in the league. Hughes wants his side to play from the back and through midfield; Tansey is a key part of this process. He splits the centre backs and gives the side a foundation to build from. One of the issues he has faced, however, is Inverness have a lot of players who want to come to the ball rather than run in behind. Miles Storey does a good job of working laterally but others moving towards Tansey tightens the pitch and limits his passing channels. But if Aberdeen come back in for him ICT will struggle to hold onto him. Hughes, with an already limited budget, will have a hard time finding a replacement. It has been a transformative year for the 23-year-old. From a bit-part player last season with Heart of Midlothian, to the point he moved to Sheffield United for game time, to an integral part of Rangers’ Championship winning team. It is the first season where promise has turned into performances. The way football has been ‘Barca-fied’ has benefited Holt. Diminutive and technical, not so long ago teams would likely have dismissed his qualities due to his lack of size. 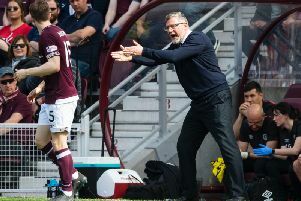 Holt often flattered to deceive at Tynecastle. For every memorable moment there were games where he simply failed to leave an impression. Yet, even on his quiet days there would be a turn, a touch, a movement or a pass which would scream ‘FOOTBALL PLAYER’ or in football parlance ‘BALLER *insert flame emoji*’. At Ibrox he has found a manager and a system which is suited to his qualities. Not quite a number 10 and definitely not a 4 or a 6 (depending on your number preference), he is a number 8, given the freedom to move around the pitch sniffing out space to hurt the opposition. In Germany, Thomas Muller is known as a Raumdueter, essentially an interpreter of space. Holt must be close to the best in Scotland at such a role. He is constantly searching for the room to take the ball on the half-turn. If he can’t he keeps the ball and goes searching again. He may have netted 12 goals with numerous assists but it would be interesting to see how many goals Rangers have scored thanks to his runs creating space for others. It has been a great week for Osman and Thistle fans. Not only has the captain signed a new deal to stay at Firhill, but more pleasingly for all concerned, he has earned his place on such an eminent list. The unconfined joy on social media from Thistle fans, plus the recognition from fans of other clubs, about their astute business is an excellent gauge on how important the player is to the team. There is no doubting Osman’s importance to not only Thistle’s midfield but the team’s structure in general – he makes those around him better. Osman is the foundation of the team. A fortified presence which brings balance to a side who have perhaps struggled for that quality since promotion back to the top level. A talismanic leader, he is well-read in the art of football. Watch Thistle in action and he always appears in the place he is most-needed, either picking up on loose balls or preventing the opposition breaking onto the defence. A previous list, one celebrating full-backs, was the focus of Thistle fans’ ire after neither Callum Booth or Mustapha Dumbuya made the top 12, with only George Seaborne has a chance to threaten the centre back list. Yet, the club have the fourth best defensive record in the league. There is no doubting the four-man unit have worked well without a stand-out defender, but they have been aided by Osman’s role at the base of the midfield and a firmer shape to the midfield three. What people who listen to the Terrace Podcast don’t know is that whenever Irvine’s named is mentioned music starts: ‘And when I get that feeling, I want sexual healing’. From a joke figure at Kilmarnock to a midfield powerhouse at Ross County, he has been one of the most improved players in the league in the last couple of years. It is a long way from being shifted about at Rugby Park looking uncomfortable with the concept of a ball that moves. Now, he resembles the white Patrick Viera, rampaging through opposition midfields like a rhino through the savannah. He was crucial in County’s survival last season and he has continued full steam ahead into this season as County celebrated their most successful season ever with a top-six finish and League Cup victory. His ability to ‘eat up grass’ has allowed Jim McIntyre to play with two strikers without losing the midfield battle, such is the ground he covers. Although that may be changing with opposition teams learning to negate County’s 4-4-2. A lot is rightfully made of qualities out of possession but the technical side of his game has improved immeasurably. His passing is much more precise and when charging forward with the ball he does so with his head up. The zenith of his season came in the aforementioned League Cup victory where he shackled and then dominated an impressive Hibs midfield. Awarded both the fans’ and players’ player of the season awards. The personification of a pocket-sized dynamo. From being speared by Steven Thompson at St Mirren, to training with Owen Coyle’s Houston Dynamo to a Scotland debut to being on the verge of winning promotion from the Championship and ending a Scottish Cup hoodoo. McGinn has had quite the year but when it’s all said and done it will just be the beginning of what is shaping up to be a stellar career. A strange statement to make considering the 21-year-old has already made nearly 150 first team appearances. When breaking through at St Mirren what stood out was the player’s power. Still a teenager he was unfazed by the physical side of the game. He still has those qualities but is now even more dynamic, more consistent and more influential. One moment he is thundering into challenges, the next he is pirouetting with the ball away from opponents. More than anyone at Easter Road, he is the player that forces fans onto their feet unconsciously as if a form of witchcraft as he drives forward from midfield. Played mostly on the left of a diamond midfield, McGinn has the stamina to play the interior role expertly taking up positions centrally and in wider areas. He effortlessly moved up to international level, outshining Scott Brown on his Scotland debut. His stand-out domestic performance was perhaps the League Cup semi-final defeat of St Johnstone, where he scored the decisive goal and nearly fired in a memorable solo strike. His next step? Adding more goals to his game. There was a fear among Hearts fans that Walker would feature very little after an injury to his knee threatened to derail his season. There was speculation that his left knee was snookered. Thankfully for those of a maroon persuasion that hypothesis was mere baloney. However, the injury forced him to sit out November through January halting the momentum the 22-year-old had been building in the Championship. In the club’s relegation season Walker was played out on the wing and the focus of the team’s attacking play. However, in the Championship he started taking up more central positions, evolving into the club’s undisputed number 10 – at the turn of the year he scored eight in 11. Even before his injury hiatus he was moved between the wing and a central role. In the last 18-months Walker has increased his work rate without the ball which has helped when playing wide but an increasingly frequent sight was him moving infield to combine with forwards and midfielders rather than taking on his full-back. All the qualities he possessed as a winger – jinking runs, protecting the ball, working one-twos and angles as well as his shooting ability – have been amalgamated with his work rate and better understanding of the game to form an incisive midfielder. Question marks still linger about his stamina; he can look out on his feet as the game enters the final quarter of an hour. He is one of the best in the league at picking up positions between the lines and has the innate ability of taking players on in tight areas. It is no surprise that one of the club’s best performances came when he and Arnaud Djoum performed well as dual number 10s at Dens Park – a spell of five goals in seven games for Walker. It feels as if McLean has been under-valued, almost under appreciated for the Dons – certainly in the eyes of the neutral observer. Graeme Shinnie, Jonny Hayes, Niall McGinn, Adam Rooney and even Ryan Jack are talked about more it seems. But after a six-month bedding in period following his move from St Mirren in January 2015, his importance has come to the fore this season with numerous displays which have said “that’s why the club paid that money for me”. He was moved around after his transfer north and couldn’t get a run of games in a specific position but it looks like that has helped his longer-term development. His versatility is a gift for Derek McInnes who is one of the most tactically flexible coaches in Scotland. McLean has played wide, as part of a two in midfield, the tip of midfield and even as a false-nine (McInnes’s words) at Celtic Park recently where he excelled. That he did excel is no surprise, this is an intelligent footballer who not only reads the game but one who is adept at taking the ball on the turn with one, or even half a touch as they talk about at Barcelona’s La Masia. Some midfield players can be guilty of slowing a game down by taking a touch or two too many, not McLean. McLean best operates in a number 10 or supporting striker position – one goal shy of the double figure mark. While he has the mobility, tenacity and passing ability to play proficiently in a deeper position, his qualities are best suited to the position further forward. He can move laterally, switching with McGinn and Hayes, where his crossing is excellent. His long-range shooting is a weapon as is his combination play in and around the box in tight areas. Season 2016-2017 is set to be a big one for McLean. This was a signing that flew under the radar down Gorgie way. Recruited in September, the Belgian made an inconspicuous start, coming off the bench to play on the right hand side of midfield in a draw at Celtic Park. With Morgaro Gomis, Prince Buaben, Miguel Pallardo and Danny Swanson, fans would have been of the thinking that the club was well stocked for midfield talent. But his talent was axiomatic – this was a different type of player from the aforementioned. The type of talent to elevate the quality of the midfield. It was as if Robbie Neilson and Craig Levien had went from catching wild Magikarp to wild Gyarados. He has emerged as a crucial part of the team’s spine. Only on Saturday was his influence evident – coming off the bench against Ross County to add a semblance of quality to the game. Everything good that Hearts did involved him. He is an all-round midfield asset, the club’s very own Yaya Toure before Toure decided running wasn’t for him. He has went toe-to-toe in a midfield battle with Scott Brown (a Scott Brown that raises his diminished game when confronted by maroon strips); displayed his ability to notch goals from midfield, whether from distance or breaking into the box; his passing is crisp and meaningful; and as Motherwell can testify he is deceptively skilful with the drag-back his favoured move to create space. He now acts as the paragon for future signings for the club moving to the next level. This hasn’t been the best of seasons for the rangy midfielder. Even those in charge of Livingston’s finances over the years would be able to count, using one hand, the successes of this season in the green and white hoops. A slight improvement or even a continuation from last season would likely have seen Bitton claim top spot – this is/was (delete as you see fit) a player primed for following in the footsteps of Victor Wanyama and Virgil Van Dijk. Like Celtic under Deila he has not kicked on to the next level. His languid style can rub traditionalists up the wrong way. He is not an aggressive player in the manner of Wanyama, he is a more technical talent. He is smart and perceptive with and without the ball. The harum-scarum nature of Scottish football does not faze him; he is more than willing to show his teeth. But he is better at using his telescopic legs to win possession and keep the ball away from opponents. He shifts his feet and balance well for someone so tall. He has the capability of striding forward with the ball and also smashing the occasional missile-guided shot into the top corner. For someone with such an abundance of talent – probably the most naturally gifted on the list – he can leave you feeling under whelmed. He should be dominating games more. The semi-final defeat to Rangers was a case in point. He was posted missing when Celtic needed him most. Under a new manager he needs to re-start his ignition and move up the gears if he is to take a big step forward to the English Premiership. Such has been the improvement in the Australian this season that anyone with a semblance of football intelligence were screaming at Ronny Deila to put him on against Rangers in the Scottish Cup semi-final defeat. Heck, questions were rightly raised as to why he wasn’t starting. Twelve months ago such a suggestion would have been scoffed at. Rogic has so far made more than 70 percent of Celtic appearances this campaign following his move to Glasgow in 2013. He has been one of very few players whose season at Celtic has been one of improvement. The 23-year-old shares similar attributes and a style to colleague Nir Bitton. However, he is a more penetrating presence on the field. Capable of operating in a deep midfield position, as well as on the wing, but he is most productive in support of the front man. Not one for the hustle and bustle side of the game, Rogic is very much a smoke-cigar-and-swirl-a-glass-of-fine-cognac kind of player. Elegant and classy, he is constantly playing on the half turn between the lines; his close control and ‘now you see it, now you don’t’ treatment of the ball allows him to create space in the tightest of areas. While he has scored nine goals so far this season, including one rasping and crucial effort against Kilmarnock, he is an unselfish player in the mould of David Silva or Mesut Ozil, looking for the dagger through the heart that a team-mate can then twist. He provides the type of service which Leigh Griffiths thrives on as the striker enjoys playing on the shoulder of the last defender. His future remains up in the air but the more he plays with Griffiths the more you get the feeling they could become an even more decisive partnership. • Article courtesy of terracepodcast.net - ‘an alternative look at the country’s beautiful game’ covering all four Scottish divisions. You can also follow @terracepodcast on Twitter.